Material / Color: Conway Stewart Classic Green Acrylic. The Nazca is named after the flat-top mountains of the Nazca Valley in Peru. 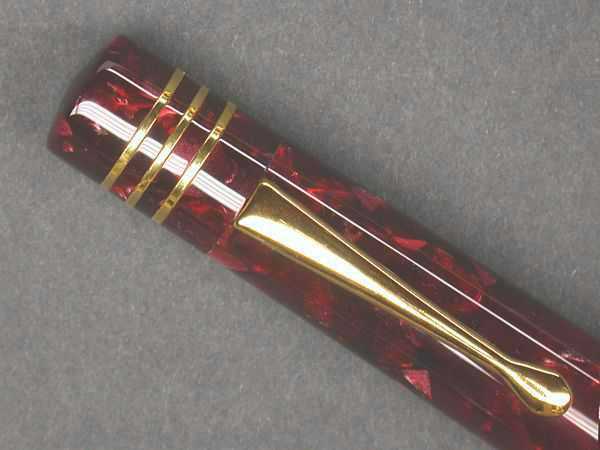 Although Nazca is actually the name of the VALLEY rather than the mountains, I thought it an appropriate name for this "Flat-Top" style pen. Historical buffs and Sci-Fi fans will know of the famous Nazca "Lines" found scattered across the tops of the flat mountains, as well as the many odd shaped skulls found in the region with the elongated craniums. 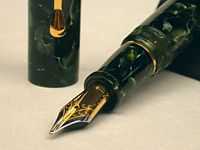 So the exceptionally tall finial on this pen is a reference to the famous skulls, while the upgraded rings on the finial pays homage to the lines. 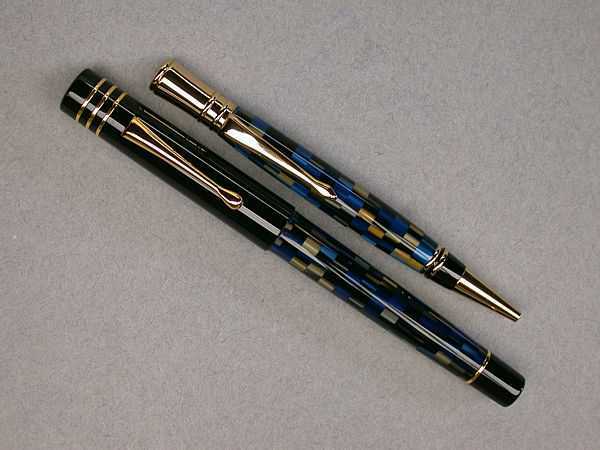 The full size Nazca has an overall length of about 6", but it can be ordered in a smaller size I call the Nazca JR that can be ordered in lengths as short as 5", and fitted with a smaller #5 nib. The most prominent feature of the Nazca is the tall finial. 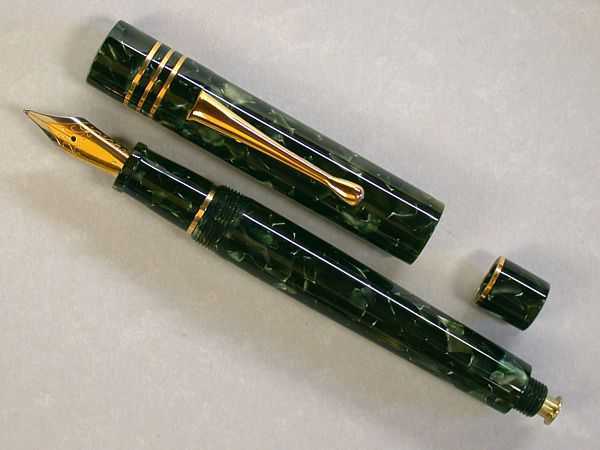 As with most other JEB's PENs, the Nazca can be ordered in any of the materials shown or you can choose your own material to make the pen unique. 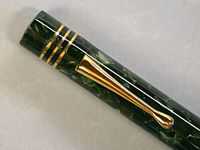 The pen can be ordered clipless or with your choice of clip finishes (nickel, chrome, 24k gold, or gunmetal). The standard Nazca has a Cartridge/Converter (C/C) inking system, or upgrade it to a button or piston filler. 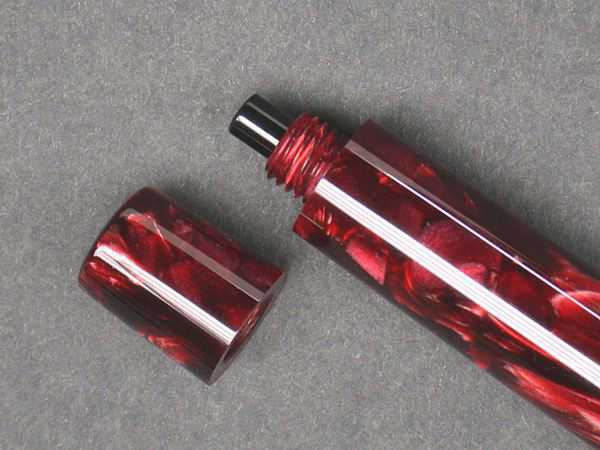 If you prefer eyedroppers, it could be ordered with a special rubber o-ring that would seal the section to the barrel so it can be filled directly with ink. It can be ordered with either a #5 or #6 nib. 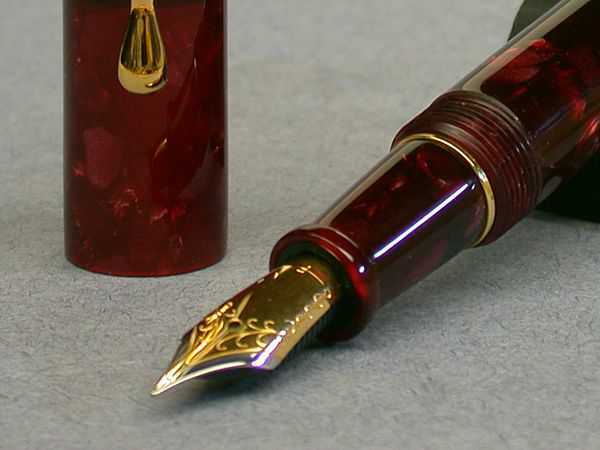 Nib finishes are 2-tone, polished steel, Black Oxide (#6 only), or Ruthenium (#5 only). Current tip sizes are fine, medium, broad, and italic and 1.1 and 1.4 (#5 only) or 1.5 (#6 only). The Nazca can be ordered with one of two different types of threads. The more typical 3-start threads, or a more coarse looking single start. Both types of threads have their advantages. The advantage of the 3-start threads is that they allow the pen to be capped with less turns, while the single-start threads allow more turns in a shorter length of the threads, so they threads can be much shorter and give the same amount of turns. Upgrades to the pen include metal accent bands at various location. You can add just one to the rear of the section for just a little touch of flash, or add at the end of the barrel (using a threaded blind-cap). 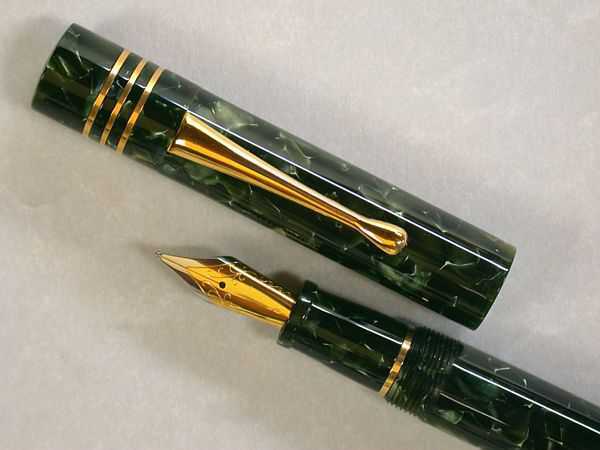 The cap posting shown on some pens is also an upgrade, so if you prefer to post your cap, please let me know so this can be added to your pen. The ultimate upgrade is to add a group of three bands to the finial for a pen I call the Nazca LINES. I also offer a variety of hand-made Pen Props and Pen Buttons. 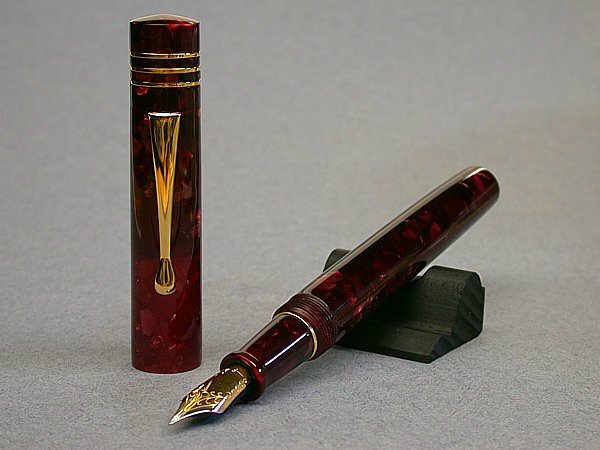 You can order a Pen Prop in a material to match your pen, or any one of the wooden styles made in a variety of stained and dyed colors. The Pen Buttons are available for any of the clipless pens. 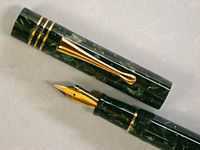 This pen includes the upgraded bands on the finial--creating the pen I call the "Nazca LINES". It also has smaller bands on the front and rear of the main Barrel. The front band is mounted on the rear of the Section, and the rear band is mounted to the base of the blind cap is removed to access the filler button. 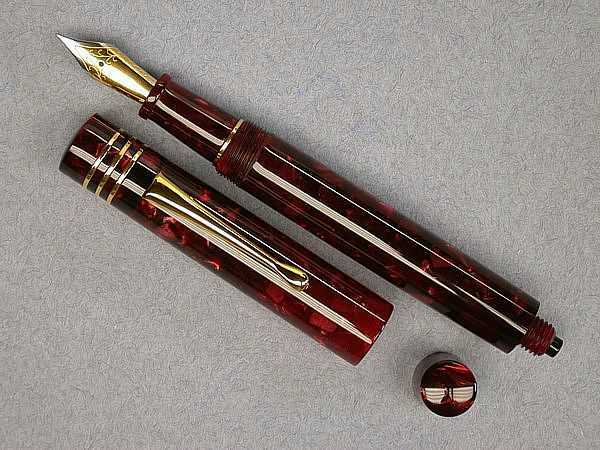 When I first started making custom fountain pens, I wanted to make one with a more complex inking system. I thought a LEVER-filler would be the easiest one to make since it only required notching the barrel. But when I started researching for parts, I found them somewhat hard to find. I eventually found some sacs and levers, so I decided to try and make a BUTTON-filler, since those were the only two parts I really needed-- I thought I could make the button. But I also had to add the BLIND-CAP on the end of the barrel--something i hadn't done yet. But after some test parts, I finally came up with a design I thought would work, and I eventually had a prototype. Before offering them for sale, I decided to sent out samples to a select few of my special customer and ask them to give the pen a test run. 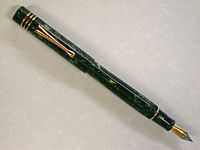 They gave me the green light and I started offering the feature to my pens. 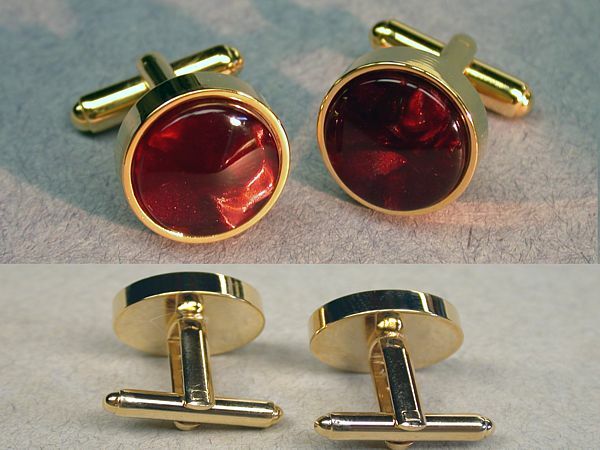 Eventually I was able to replace the acrylic buttons with BRASS buttons with the wider flat top like those used in vintage pens (see the Red & Black Cranberry Lines Nazca here). 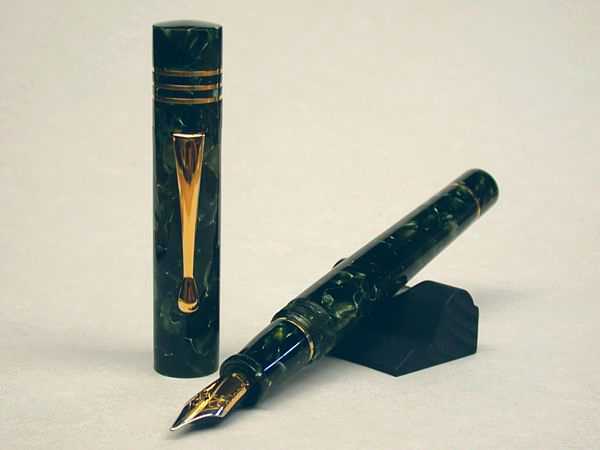 The material is another of the original acrylic colors used by the former Conway Stewart Pen Company, and was used for many years on several of their pen styles (two recent styles are the 100 and Churchill). 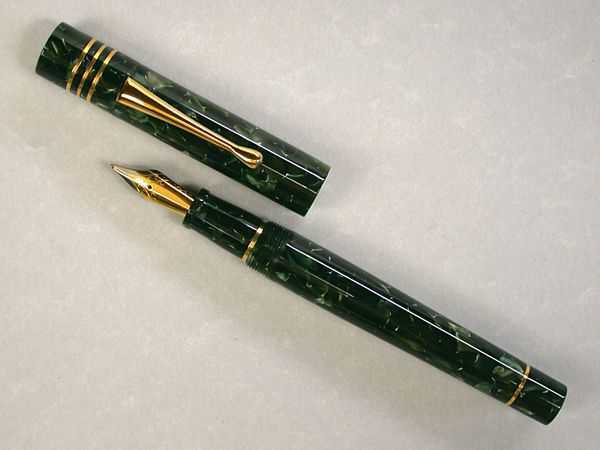 This color is called "Classic Green", and is very similar to the JADE GREEN used in a few other pens, but the Classic Green is a bit more subtle. It's hard to pin-point the difference, but I think Classice doesn't have quite as much of a yellow tint as the Jade. I think the more subtle green shade allows the gold in the hardware to stand out well. Color / Material: Conway Stewart Classic Green Italian Acrylic. Diameter - Barrel (max) = .56" / Cap (max) = .59". Nib - 2-tone steel #6 Meister. Clip: 24k Gold Tear Drop. Also available as C/C or Piston versions.